According to the World Health Organizaiton, approximately 10 percent of the world's population has a disability, and this is probably a low estimate. In developing countries, this population numbers at least 400,000,000, and they are among the poorest of the poor. The UN cites a prevalence rate of disability of about 10%. Within established economies, estimates vary from 8% to over 20%. In Serbia, the poverty rate of disabled people is 70 percent. In Honduras, people with disabilities have an illiteracy rate of 51 percent compared to 19 percent for the general population. In the United States, there is almost a 70 percent rate of unemployment among disabled people. 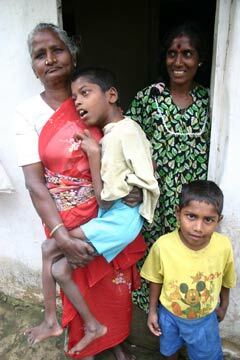 Here in Sri Lanka, about 90 percent of disabled people are unemployed. And in some parts of the world, as many as 80 percent of disabled children die before the age of 5, even in areas where the overall child mortality rate is less than 20 percent. As part of the international efforts to fight poverty, the World Bank has called for strengthening global cooperation to "unlock" opportunities for the more than 600 million disabled people worldwide, of whom 400 million live in developing countries. One of the biggest challenges facing the disabled community is changing people's attitudes and expectations with regards to persons with disabilities. The world community needs to work toward three main goals: access, inclusion and awareness of the rights of disabled people on a global scale. Unfortunately, the barriers that people with disabilities face—the barriers of isolation, exclusion, and low expectations—are pervasive around the world. But if disabled people work with each other and with family, friends, and associates, everyone's lives can be enriched. Sri Lanka's Hill Country Disabled Group is one such circle of friends of the disabled who aim to show that, given the same opportunities as others, disabled people can live richly satisfying lives as full partners in Sri Lanka's social and economic development.